Handling challenging callers appropriately is an essential skill for any frontline agent. This self-paced e-learning program equips your agents with the ability to recognize different types of challenging callers and provides them with techniques to handle them calm and confidently. Not only will your agents be able to turn angry callers into happy customers, they will also learn how to decrease the average handle time and the average speed of answer while doing so. Challenging callers come in different types and flavors, from the emotional, to the confused, and the over talkative. This course teaches different techniques for each type in order to bring the call to a positive end. Handling challenging callers may seem overwhelming to many agents, but with the right training, agents will be able to handle each in a professional and effective manner. This course will teach agents how to recognize the different types of challenging callers and how to handle the specific types appropriately. In addition, they will learn how to significantly reduce their average handle time (AHT) and average speed of answer (ASA) by applying established call handling techniques. To balance good customer service with the length of the call, while considering the caller’s requirements. 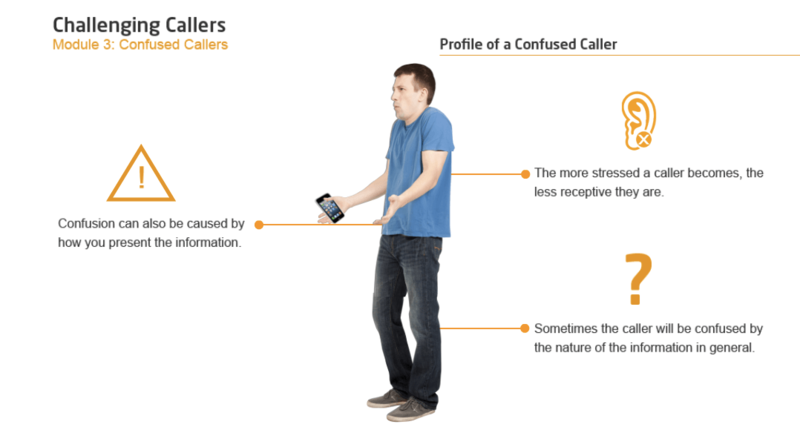 Established techniques to handle confused and emotional callers, to arrive at a satisfactory call conclusion. The difference between angry callers and those who are impatient and just want to move the call along quickly. 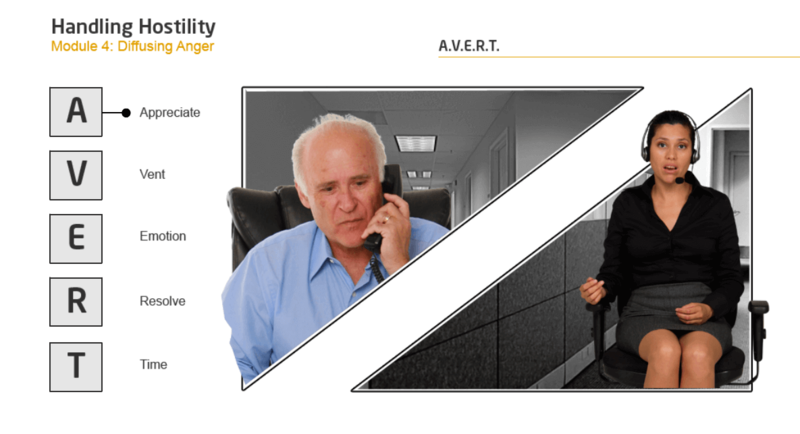 The two key types of complaining callers and how to deal with both types effectively. Dealing with an angry, aggressive customer is nearly inevitable in a contact center environment, yet it can be a very intimidating experience for agent. Those equipped with proper techniques will feel more confident and will be better able to handle angry customers professionally. This course focuses on the angry customer and key reasons for their frustration. Agents will learn fundamental principles that they can apply to keep calm in heated situations. They will learn about the AVERT model that is designed to de-escalate a call quickly. Learners will benefit from interactive scenarios that develop the essential skills required to handle hostile and personally abusive callers effectively. The challenge of dealing with angry customers. The basic principles of emotional intelligence and how these can be applied to manage their emotional state and influence the caller. Communication skills to de-escalate situations involving angry customers. To use the AVERT de-escalation technique when dealing with angry customers. To apply established best practices when confronted with personal abuse from an angry caller. In this module, we'll test your knowledge of the key learning points from the course. To pass, you must answer at least 80% of the questions correctly. We offer bulk discounts for orders containing 5 or more seats for a program or bundle. Check our pricing options for Managing Challenging Callers below. If you apply for bulk pricing, please contact us to place your order. The Managing Challenging Callers program is designed by call center experts to provide a practical and engaging learning experience. Start today.